Attention flake fiends... You'll want to see this new flaky topcoat from Picture Polish. It's a brand new shade called Festival, and it's really really cool. It's a combination of all the different flake types (blue/green, red/orange, gold/orange/green) in different shapes and sizes, all in a clear base perfect for layering. One coat of Picture Polish Festival over two coats of Essence Prismatic White. I normally love flaky topcoats over white, but I don't think these 'pop' enough over this shade. It looks pretty, but it's subtle. Then I had to try it over a darker color to see how it looked and WOW. This is what Picture Polish Electric Blue looks like before adding Festival. 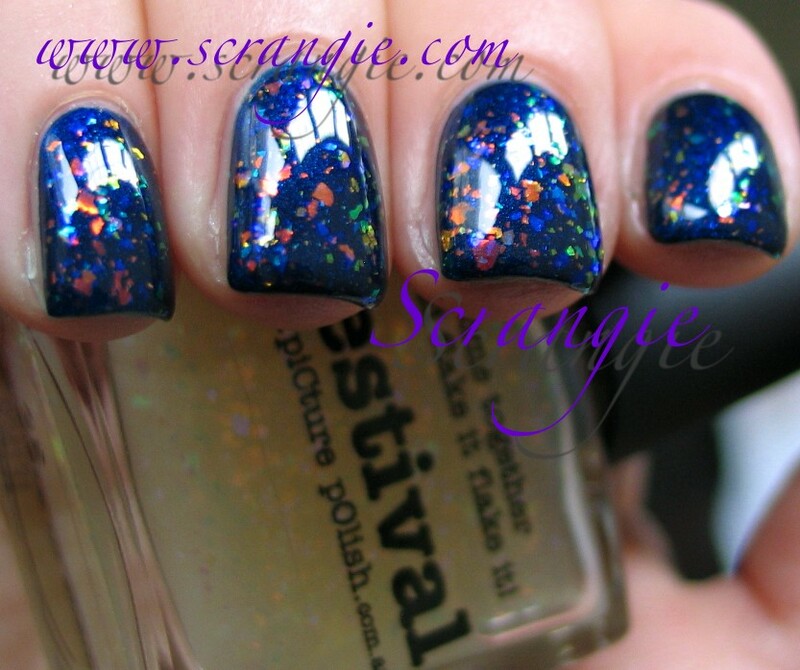 A very dark, bold blue shimmer. And this is how it looks with two coats of Picture Polish Festival over it. You can enlarge these to see the different shapes and colors, the second picture shows the duochrome shift on some of the flakes. Isn't this awesome looking? The blue flakes really make it, if you ask me. Don't think it would be quite as cool looking without the blue ones. The only complaint I have about Festival is that the flakes are more sparse than I'd like them to be. I didn't get enough coverage with only one coat, but it looks perfect at two. The texture is a little thick, so if you do two coats, you may want to wait a little while in between each coat just to help it dry smoother and faster. I'd love it if the flakes in this were just a little more dense so I didn't have to do two coats. Festival is already available on the Picture Polish website, but they have plans to release more flaky topcoats (Picture Polish Flakie Cover is the offical name) soon. Picture Polish is located in Australia but does ship internationally, so please refer to their shipping page for rates. They also have the Picture Polish Network, which is a program you can join to get discounts if you want to order a lot or if you want to resell, so that might be worth a look. Looks kinda like Color Club's "Covered in Diamonds"! Oh sheesh! This is super pretty! Gorgeous, I caved and ordered it yesterday! Good to know! I just recently bought Covered in Diamonds because the colors made me drool. The flaky colors seem similar is what I should have said - sorry for that. I intend to give it a whirl this weekend regardless, but trust your comparison. Thanks, everyone! This is such a fun color to layer. Gorgeous mani... I really like the flakies! 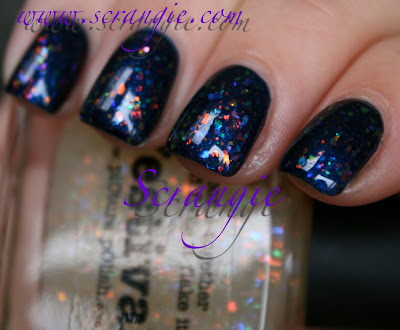 Looks a lot like Cult Nails Clairvoyant/Unicorn Puke, or the Deborah Lippman topcoat from the Lady Gaga set, though. Looks gorgeous over the dark polish. Very pretty. So pretty but I'm going to wait for the new Finger Paints flakies!! It's gorgeous, but a bit ridiculous, IMO, for US customers - almost $12 for the polish, plus another $22 for shipping? Hopefully they can work something out for a licensed US distributor or something. Wow the flakies!! And I think over white it´s really subtle and beautiful. I would love to see have prismatic white on its own too! I have one called "prismatic effects" from Catrice, it´s actually a top coat and I love it!! Yeah, they didn't have the other one (I think it's Rise & Shine??? I'm not sure...). And thank you! I think I've gotten a little better at capturing nail polishes, but makeup is not as easy for me. Probably doesn't help that I only actually WEAR makeup once in a blue moon, lol!